PLANET EARTH GRIZZLY BEAR 10"
View other bears from Retired Steiff Bears. Licensed products are within the Steiff range of bears and this means that they have been given a licence to entitle them to make some of the famous characters from cartoons and films. Enthusiasts and collectors are fascinated by how Steiff have interpreted them and how authentic they are to the original and love seeing their favourite character come to life....just like this wonderful addition to their growing range. BEEP! BEEP! LOOK WHO'S HERE!!........ 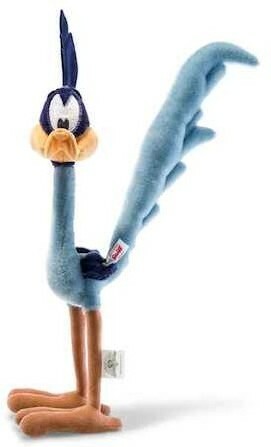 THE ROAD RUNNER!! The Road Runner is a cartoon character from the Looney Tunes and Merrie Melodies series of cartoons, which also feature Wile E. Coyote, who tries every means he has to trap the Road Runner, who always manages to outmaneuver him. When the chase gets close, Road Runner delivers a well-timed "Beep! Beep! ", unfurls his little tongue, steps up the power and shoots away! Steiff have created this character in the finest blue mohair and he has embroidered eyes, an orange beak and big tail. He stands on oversized feet and looks quirky, with a crest of two feathers on his head! It has the famous "Button in Ear" and a white label, with red writing, showing that it is only limited to 1500 pieces worldwide, making it very collectable.